As DarcMatter’s platform continues to work with alternative fund managers interested in reaching investors globally via efficient online channels, we thought it would be important to share some insights and research on an asset class within alternatives that has recently become a focus of news and attention from the array of accredited investors. From RIA’s to UHNWIs (Ultra-high-net-worth-individuals) actively participating in the crypto economy, and Family Offices to Institutions simply information gathering to potentially enter at the right time, it is clear that there is interest in entering the crypto-verse. 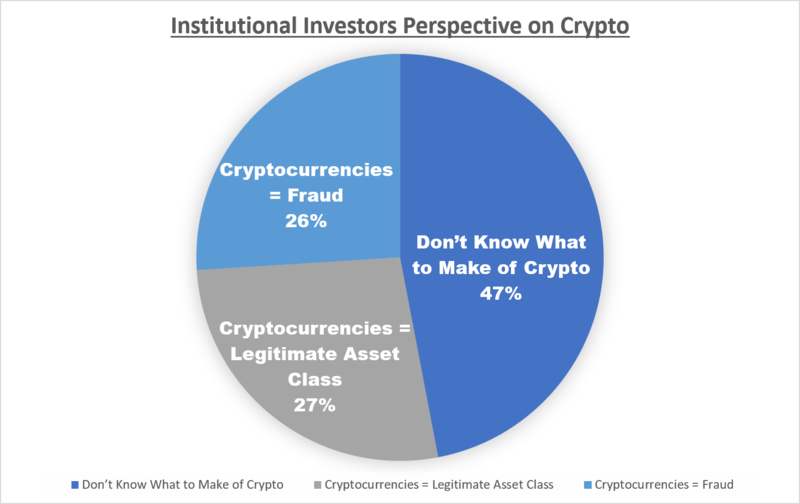 The specific interest in crypto funds is driven by the perception of potential safety via a more familiar fund structure as compared to investing directly into cryptoassets as an individual. Crypto funds allow interested investors to participate in the market that has seen both its share of great success and great volatility on a daily (if not hourly), basis. We wanted to share some information on the growing crypto fund market and share some perspectives on this asset class’s viability for investors who are interested in participating in the crypto-verse via a crypto fund. What is a “Crypto Fund” and Why is it of Interest in Alternative Investments? A crypto fund is exactly what it sounds like. It is generally a hedge fund in which the investment strategies are based on crypto assets. Though there are other structures that more closely resemble a Private Equity or Venture Capital structure, there are far more crypto hedge fund structures available for investors to access. The premise behind creating a crypto fund is to make it easier for investors to access and navigate through the crypto investment market, by deferring to a professional crypto manager, also known as the portfolio manager in the traditional manner. This portfolio manager, will potentially manage the LPs investment into various cryptocurrencies (such as Bitcoin, Ethereum, Litecoin, XEM, etc) and ICOs (initial coin offerings), based on the fund strategy. The goal of the fund is to obviously produce gains based on your investment. Much of the interest in crypto funds is driven by the increased market speculation and the share potential in percentage gains for those that entered the industry at the “right” time. This is not to say that the market is stable, and gains are guaranteed, because the crypto market is extremely volatile, with varying opinions on crypto’s vitality. However, we believe there is opportunity in chaotic markets like crypto, enabling the creation of crypto funds as an asset class, which is only further substantiated by the 225+ fund managers touting crypto strategies. As with traditional fund managers, the core job of the manager is to create a specified risk-return strategy and utilize as much information as possible to yield the results that investors expect. As with much of the investing universe, including stocks and bonds, it increasingly becomes difficult for individual retail investors to find an edge. Why Should Investors Take Note of Crypto Funds? 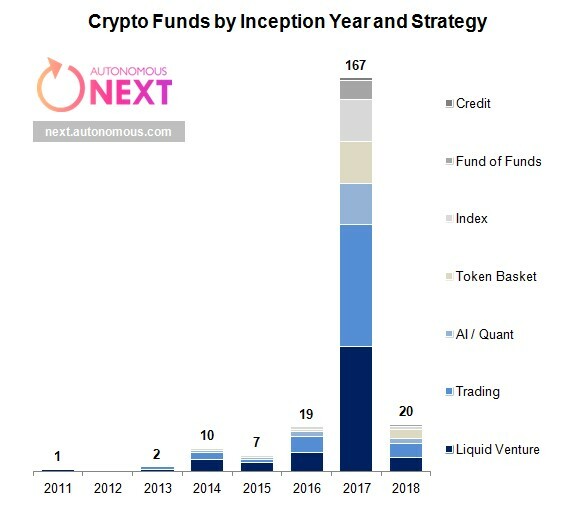 The number of crypto funds grew eightfold in 2017 and is also continuing to increase thus far in 2018 as well. 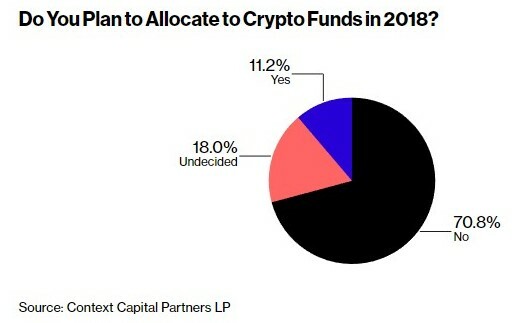 Given the current state of the crypto market, we’ll see how many additional funds are created this year. As regulation continues to develop, we would anticipate this making the barriers to entry a bit more difficult while concurrently creating guidelines to allow sophisticated managers and firms to participate growing the market in a new but mature method, with a subset of serious crypto funds for investors to choose from. As we continue to do due diligence on crypto funds interested in onboarding on to DarcMatter, we wanted to share some key details on the crypto fund universe, and what we are seeing as key strategies and themes in this emerging investment space. Crypto Funds have continued to increase throughout the years, with over 20+ noted for 2018 as of February 2018. 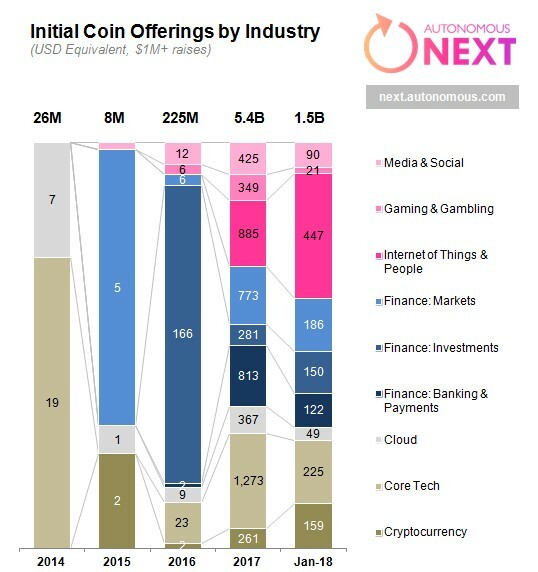 Over $5.4B in ICO Offerings were funded 2017, with a significant proportion allocated to Finance, Core Tech, and IoTs. 2018 is following a similar trend, with over $1.5B allocated through January 2018. Please keep in mind that investing in private funds are risky, illiquid and can lose capital. Investing in crypto-assets has additional risks including lack of a track record, regulation, heightened volatility, and technological changes to the industry. One should carefully review the full offering materials before making any investment.